Well, the brief was to hit the big German snack Kinder Schokolade straight between the eyes and this case study group did precisely that. So much so that the packaging looks a little bit similar to the strategic competitor it’s taking on. If the waves in the lower section of the pack are protected, or the concept with the smiling face of the children, this brand could be accused of passing off. It’s a fine dividing line between playing to a category signal and me-too’ing it. The benefits are clearly indicated all over the packs, with the Milky Way cream filling (instead of milk), the practical bars, the gift, the usage occasion/positioning of getting out of school, and then the name… yes, I had to remind myself what Yolo was about. I’m used to the students inventing concepts that seem to be targeted at people like themselves, young ambitious adults with the future for the taking, so much energy, so much to go for. Yes, Yolo would be a match with 20-somethings. 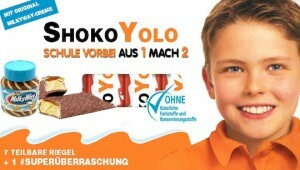 But older people these days also buy into the Yolo concept. 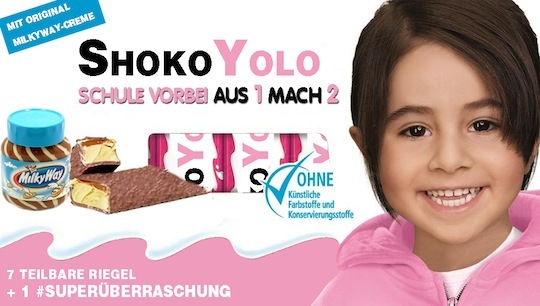 Perhaps then the only question is whether this yolo concept is a big stretch in association with kids and chocolate? Nevertheless, it was a case study winner and let’s assume the customers (or their parents) wouldn’t have thought IOBO – I only buy once. This entry was posted in Winners of case study and tagged Kinder. Bookmark the permalink. Oh boy, they didn’t win with a gendered product, did they? And I thought this was the 21st century.